Dr Cameron Webb is a Clinical Lecturer with the University of Sydney and Principal Hospital Scientist with the Department of Medical Entomology at NSW Health Pathology based at Westmead Hospital. Cameron's primary focus is understanding the role of environmental management and urban development in reducing the risks of mosquito-borne disease. 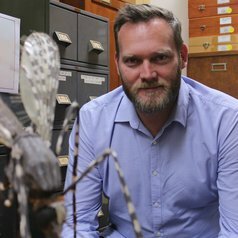 He has been called on to provide expert advice on a range of medically important arthropods, such as mosquitoes, head lice, ticks, mites, biting midges, bed bugs and flies, to local, state and federal and international government agencies. In his position with the University of Sydney, Cameron regularly provides lectures in a range of undergraduate and post graduate courses and has supervised a number of research students including collaborative projects with the University of Western Sydney, the Australian Catholic University, University of Wollongong and the University of South Australia.